Those wanting an earphone with top-class build quality, excellent resolving power and a hyper-revealing signature will find they probably won’t need to look higher than the HS1503AL. Though hybrids and BA earphones with 2-digit driver counts have become commonplace as of late, there’s no denying the appeal of a well-done single dynamic driver. Acoustune is a Japanese audio manufacturer that specialises in single dynamics, utilising tough Myrinx drivers and meticulously designed acoustic chambers to provide a resolving yet coherent sound. I first encountered their HS15XX earphones at Portafes, Japan. Their industrial designs allured many but their sound was is undoubtedly the factor that left a lasting impression. Their new HS1503AL is a successor to the HS1501, implementing similar technologies while introducing greater treble extension and a more balanced tuning all at a slightly cheaper ~$420 USD asking price. Further details on the HS1503AL and Acoustune’s innovations can be found on their website. The unboxing experience of the HS-range of Acoustune IEMs is sensational. All come within a huge metal hard case that keeps the IEMs and accessories well-protected during transit. Inside are the earphones within foam with the cable wrapped around the inlet. The faux leather magnetic carrying case lies to the right. Underneath is are a plethora of ear tips, each offering different fit and sound. In addition, Acoustune provides a matching faux leather cable organiser and Velcro strap that can be attached to the cable. It’s a terrific experience that leaves an impression on the buyer and a practical accessory set for daily use. 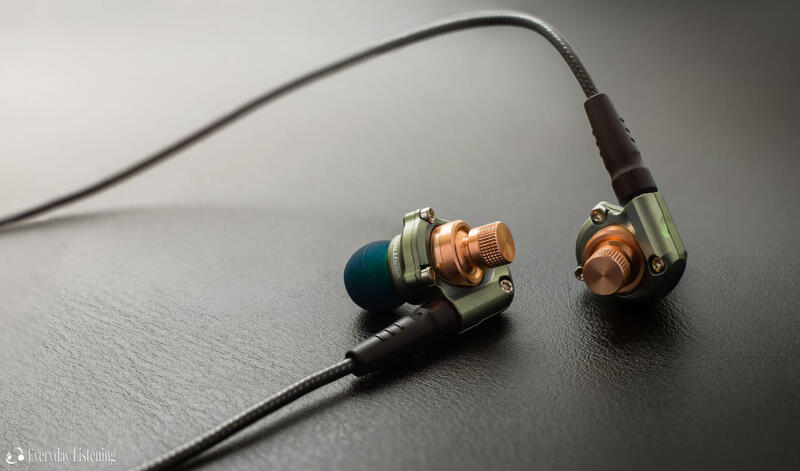 Acoustune’s IEMs are the definition of unique and the embodiment of “made in Japan”. There’s nothing on the market that even remotely resembles their industrial design; with segregated sound chamber and external frame that serves to reduce mechanical interference. Their entirely aluminium build astounds with its density and the level of finish is top-notch, even under one-one pixel peeping scrutiny. Despite their unorthodox styling, the earphones actually have quite a comfortable fit. This can be attributed to their smooth, rounded inner face that feels similar in the ear to a standard pod-style IEM such as those from Westone and Shure. As such, none of the earphone’s sharp angles contact the ear, mitigating hotspot formation and enabling a comfortable fit over extended listening. They are fairly shallow fitting, however, they are stable due to their well-shaped design and over-ear fit. Still, though not obviously vented, isolation is just average. With a bassier tuning, they suffice for most public transport but will struggle on the subway and during air travel. The earphones utilise a removable MMCX cable that’s hugely improved over past Acoustune IEMs. It’s just as thick and sturdy but is now far suppler, with zero memory and minimal microphonic noise. It’s built incredibly well-built, with a beefy right angle plug, low-profile continuous y-spit and textured MMCX connectors that enables easy removal. The cable feels built to last and its compliant nature means it isn’t cumbersome during daily use despite its size. What cable would you recommend with this iem? I am using the ak70mkii and i would like to enhance the treble extension and a bit more separation and clarity. Thanks.